With bedside table adornments, less truly is more. Begin by allotting bedside real estate to items you consider absolutely necessary, perhaps a lamp and clock. Add one beautiful item, such as flowers or an artful object that appeals to your aesthetics. 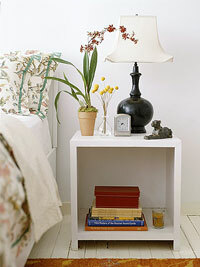 For an urban look, warm up a sleek bedside cube with a curvy lamp, potted orchid, tiny cluster of flowers, and candle. Get practical with a small clock and leather storage box. kakaiba ang bedside table na yan, but i like it. so lovely.. i want! i want!